Dabble in marketing. Leave the box of cereal on the table during breakfast. Granted, food packages are largely advertising and "free" offers. But descriptions like "sweet raisins" and "crunchy flakes" help instill appreciation for sensory detail. And "plus $4.95 shipping and handling" teaches the importance of reading the fine print. Find geographic links to a child's interests. Get out an atlas and chart the course of the Tour de France for your budding Lance Armstrong. Pore over a map of the constellations with your junior astronomer, pointing out the names of all those fascinating stars and planets. Enlist a helper. Ask your child to read the directions as you assemble a pasta salad or microwave cart. Children will learn the practical poetry of clear, precise terms: beat eggs; align nut, washer, and bolt. Recruit a co-pilot. On your next outing, strap an older child into the passenger seat as a navigator. Something about translating the grid of sideways-written street names into real places with houses and a corner deli brings words to life. Mix it up. Not all children gravitate towards the same reading material. Just because your son isn’t interested in Harry Potter or your daughter doesn’t like The Magic Treehouse series, doesn’t mean they’re destined not to be readers. Choose a current interest as a launching point. Subscribe your environmentally aware youngster to Ranger Rick magazine. Or introduce your American Girl doll collector to the history section of the children's library. Get old-fashioned. Ask friends and family to write your children letters. Email aside, there’s something magical about opening up the mailbox and pulling out an envelope with your name on it. Letters that come unedited from real people give a sense of how much personality the written word can convey. Sensitivity to different writing styles seeps into a child's mind when a preteen neighbor uses "like" every other sentence and Grandma signs off "Hugs and kisses." Realize books can feel like hugs. Let children experience the healing power of feelings shared in writing. When children lose a pet or experience rejection, books can dispel the belief that they suffer alone. 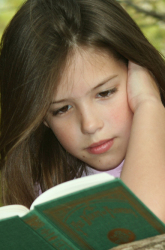 More reading help for your kids can be found on our reading games page or our reading resources page.